An armed man shot dead by police in east London has been named as 40-year-old Andrew Hammond. 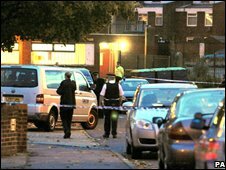 Mr Hammond, known as Andy, was shot four times by a marksman on Wednesday at Honeysuckle Close in Harold Hill, Romford, where he lived. He was pronounced dead in hospital on Wednesday, the Independent Police Complaints Commission (IPCC) said. The shooting followed a domestic dispute between Mr Hammond and a woman, who is being treated in hospital. Three guns were seized at the scene, according to the IPCC, which is investigating the incident. Witnesses said Mr Hammond pointed assault rifle-type weapons at bystanders as he wandered through streets near his home. Witness Daniel Jackson, 14, said: "He was holding two guns... he was shouting 'get down on the floor'." Another witness, who did not want to be named, said: "At times, he was on the phone to police and said, 'I don't care, you can shoot me'. "He did not care. He was walking everywhere with the gun." A post-mortem examination was carried out on Thursday but the results have not yet been released. Three firearms officers have been relieved from duty while the investigation takes place.